© Sterilising, disinfecting and renovating bee hives will be necessary sooner or later when dealing with second hand equipment or a winter loss or as part of an ongoing maintenance programme. It is advised to sterilise, disinfect, renovate or replace bee hives, frames and combs before their third winter. Infectious diseases that can persist on equipment are not common but all bee hives, equipment and hive products should be treated as infectious as a safeguard. The following advice is for the hobby scale beekeeper and requires minimal equipment. To say there is more than one way of doing things is an understatement so the choice is yours. Be aware that sterilising, disinfecting and renovating bee hives requires adequate health and safety risk assessments, the use of appropriate safety equipment and a general knowledge of how the world works. After removing all beeswax, comb and propolis, bee hives and frames must be sterilised and disinfected by either soaking in 0.5% sodium hypochlorite (bleach) for 20 minutes before rinsing and drying or scorching with a blow torch. These are the only methods available that are proven to kill all the bacterial spores that may be present (unless access to irradiation equipment is available). Tip: Before starting, first cover a work area with plenty of newspaper. 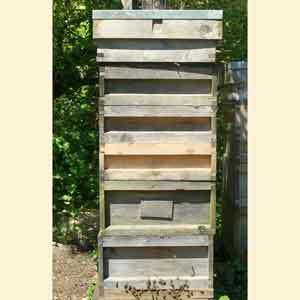 Sterilise or Replace Bee Hive Frames and Combs. The time and energy needed to properly sterilise and renovate bee hive frames before reusing them is often not cost effective. All of the beeswax comb and propolis must be completely removed from the frames before the frames must be bleached or scorched which is easier said than done properly. The yield of wax from old combs is often not worth the time and energy to extract it on a small scale so frames and comb are best destroyed by burning. Frames that contain stores and wax can be rendered and the frames then destroyed by burning. The honey should be treated as infectious so must not be fed back to the bees though it is perfectly edible and the beeswax can be used. Sterilise and Renovate Bee Hives. Bee hives should be first scraped with a hive tool to remove beeswax and propolis. Make sure to catch this on the newspaper so it can all be burned when finished. If the hive has fittings such as runners and spacers it is important to remove them first. They will otherwise harbour and shield disease underneath which is why we do not recommend using them. Ensure all the internal corners of the hive woodwork are thoroughly scraped clean. Bee hives must then be sterilised and disinfected by either soaking in 0.5% sodium hypochlorite (bleach) or scorching with a blow torch. Equipment must be soaked in the hypochlorite for at least 20 minutes before rinsing and drying. We prefer to sterilise and disinfect by scorching. We also scorch the outside of the hive, the carbonised layer acts as a wood preserver especially when finished with a couple of coats of Linseed Oil and Beeswax which provides added weather proofing. Check the joints on all the woodwork are tight, fixing with glue and nails if necessary. Any gaps or holes caused by mice, squirrels or woodpeckers can be patched and filled with Milliput. Metal equipment such as bee hive smokers and hive tools can either be scraped or scrubbed with washing soda solution to remove beeswax and propolis and then bleached or blow torched to sterilise and disinfect. Hive tools can be a common source of disease transmission between colonies so it is good apiary hygiene practice to scrub them clean with washing soda solution between inspecting one hive and the next. A wash and scrub with washing soda solution and a sponge scourer is adequate, a small spray bottle of washing soda in the apiary is useful for this purpose. Plastic equipment such as queen bee cages and queen excluders can be scrubbed with washing soda solution to remove beeswax and propolis and then bleached to sterilise and disinfect. Clothing such as beekeeping suits and leather gloves can be cleaned by washing with washing soda solution to remove beeswax and propolis but the nature of these fabrics mean they will not withstand the prolonged use of a blow torch or bleach so there is not a practical and effective way to sterilise and disinfect them. The best that can be done is to keep them clean and renew them regularly. Disposable nylon or latex gloves can be used by themselves or over leather gloves. These can be scrubbed clean with washing soda solution between inspecting one hive and the next and then sterilised and disinfected with bleach or disposed.